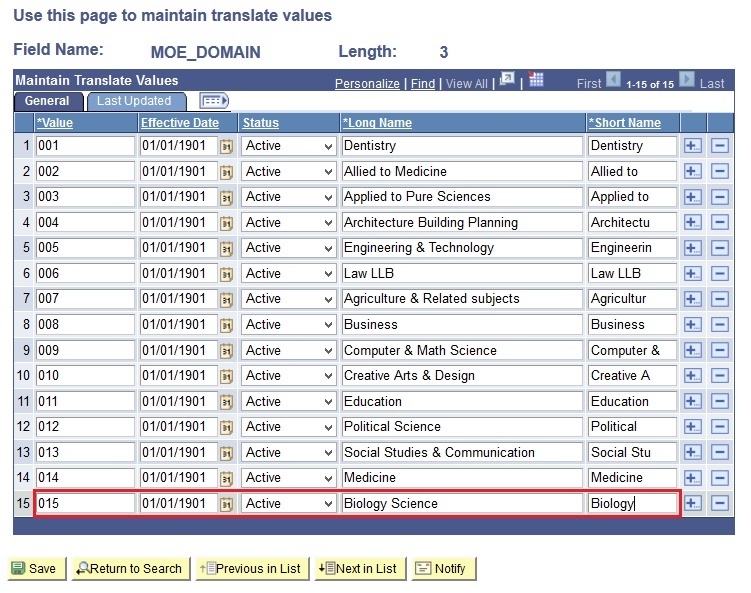 "This function allows the users to manage the values for the Domain field in the Scholarship Application Form page. Thus, in the future, the users will be able to make changes to the values in Domain field (e.g. change in domain description or add additional values)." Roles Involved: MOE Scholarship Section - Administrator. On the Find an Existing Value tab, enter 'MOE_DOMAIN' into the Field Name field as shown. Click the Search button next. 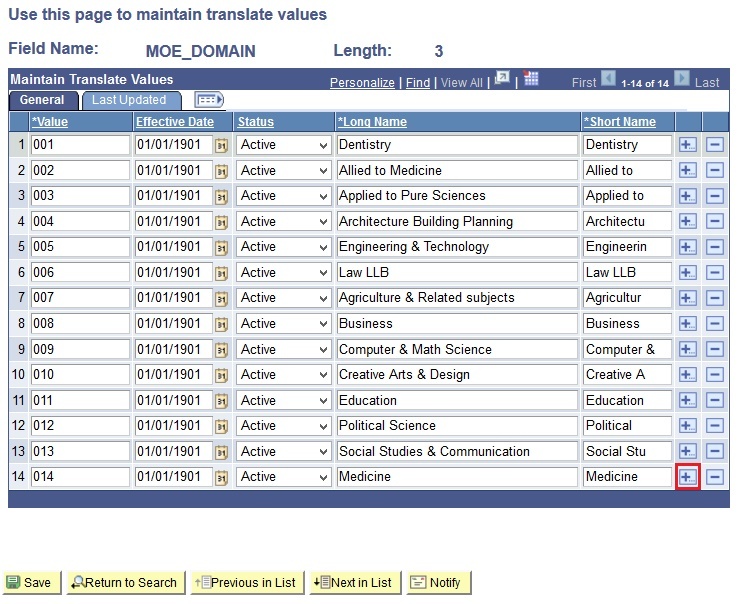 To add a new Translate Value in the Maintain Translate Values page, click the Add a New Row or '+' button. 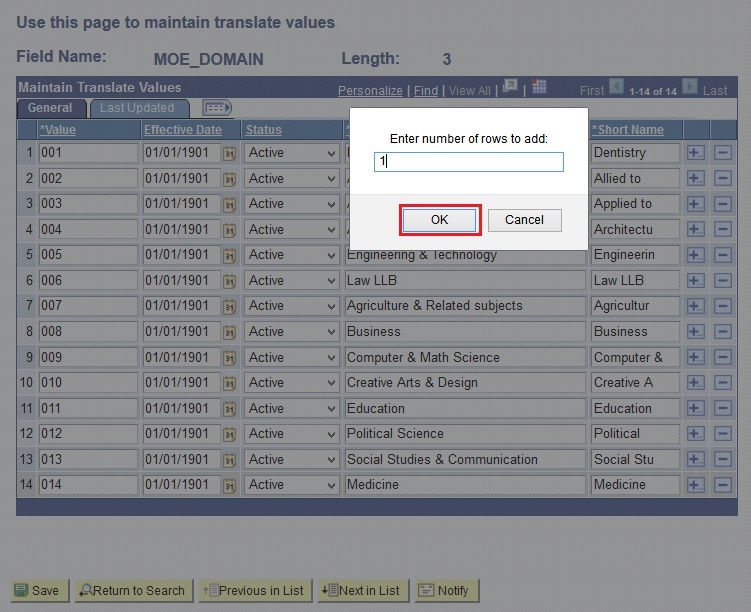 Note: On this Maintain Translate Values page, users can either Add or Edit any existing Translate Values for the specified Field. Also, do not press the '-' to delete the existing values as some data might be lost and caused data integrity issues. Enter the Number of Rows to be added and click the OK button after that. 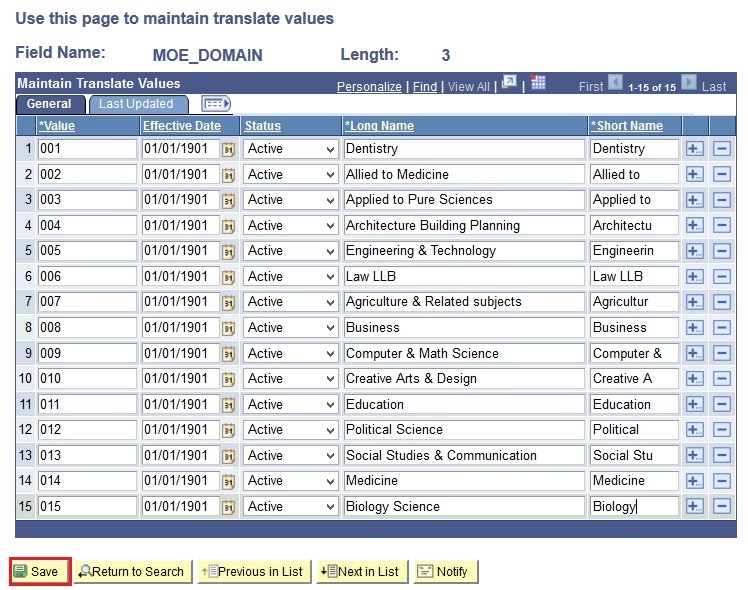 Note: The Number of Rows determines how many fields you want to add for the Translate Values. On the Maintain Translate Values page, enter the details in the Value, Effective Date, Long Name and Short Name fields and choose the Status for that value. Note: Status must be set to 'Active' so that the value will be displayed. If the status is set to 'Inactive', then the value will not be shown. Value: Field that capture running number. Effective Date: Field that capture the effective date for the translate value. Status: Field that capture the current status of the maintain value. Long Name: Field that capture the long name for the maintain values. Short Name: Field that capture the short name for the maintain values.